The US is facing a new housing crisis. No, it has nothing to do with subprime mortgages or bloated home equity balances. This time the nation is dealing with shortages of rental housing, a problem that will become increasingly acute in years to come and may result in a material drag on economic growth. Americans are simply not building enough homes to accommodate the population's needs. The number of housing units completed per capita in the United States remains a fraction of historical averages. The slight improvements from the lows of 2011 have barely scratched the surface. Similarly, in spite of recent increases, residential construction spending as a fraction of the GDP remains at the lowest levels than at any time since WWII. At the same time demand has been on the rise. As an indicator, the chart below shows Google search frequency for rent related phrases. The myth out there is that this problem is somehow limited to some of the coastal areas of the United States - NY, Florida, California, etc. It is not. 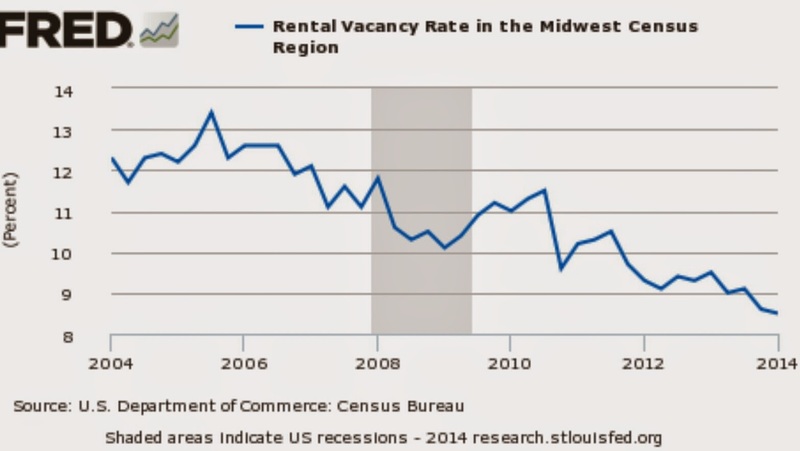 Just take a look at the rental vacancy trend in the Midwest. This shortage is of course translating into rising costs of shelter across the country. The overall shelter CPI is headed toward 3% and the rate of just rental cost increases is even higher. It is materially above the overall CPI rate and expected to rise further. This trend, combined with massive amounts of student debt (see discussion) will be increasingly taking a bite out of consumer spending. The percentage of "housing cost burdened" households (those who spend more than 30% of their income on shelter) has been rising rapidly. JCHS (Harvard) - The recent deterioration in rental affordability comes after a decade of lost ground. The share of cost-burdened renters increased by a stunning 12 percentage points between 2000 and 2010, the largest jump in any decade dating back at least to 1960. The cumulative increase in the incidence of housing cost burdens is astounding. In 1960, about one in four renters paid more than 30 percent of income for housing. Today, one in two are cost burdened. Even in 1980, following two decades of worsening affordability, the cost-burdened share of renters was just above a third. Given such demand, why does residential construction remain so tepid? Since 2008 the acquisition, development and construction (AD&C) lending has been too restrictive to accommodate the rising demand. That in turn has led to insufficient numbers of developed lots for construction. US News: - According to a recent National Association of Home Builders industry survey, 59 percent of builders reported the supply of developed lots on their areas was low or very low. This is a significant increase from a similar survey undertaken in September 2012. In fact, the 59 percent response is the highest rate recorded since 1997, when this first survey question was first posed. Other reasons include highly restrictive zoning rules, as existing homeowners limit new construction in order to boost their property prices. Whatever the case, residential construction is running at half the level of longer term housing demand. And while the nation can get by for now, consider the situation 5-10 years down the road. Economists, politicians, and the media continue to focus on slow home sales as an indication of weak housing markets. But they are simply "fighting the last war". The looming crisis is not about how often homes change hands, but about the shortage of rentals and the rising cost of shelter that the new generations of Americans will increasingly face.